We were leading Nancy’s high school camping club on a three-day outing. We took them on a short hike the first night after dinner. 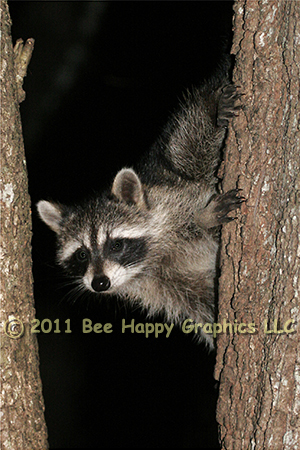 A mother raccoon and her four little ones were raiding the trash cans, but when we arrived they scurried up a nearby tree and peered at us from behind the branches. Nancy took a few pictures. As we moved on, the raccoons returned to the trash cans. Photographic details: Canon EOS 20D camera w/ EF 100-400mm f/4.5-5.6L IS USM lens set at 120mm. Flash was used. Camera was on f/4.5 for 1/60 sec at ISO 1600. Fine Art Paper 14" x 11" 16" x 111/2"
Canvas N/A 191/2" x 14"